The best things in life are bubbly. I am an admitted Starbucks addict. Therefore when I heard that Starbucks has a new drink out called the “Flat White,” and subsequently learned this category of beverage is supposedly the darling of Australian coffee aficionados, I was excited. I really wanted to like the flat white. Served in a tall sized cup, the flat white consists of two ristretto shots (kind of like espresso shots, but with less water involved) and foamed whole milk that has been carefully crafted to have a thick, velvety texture, thicker than in a cappuccino. That sounds delicious, right? 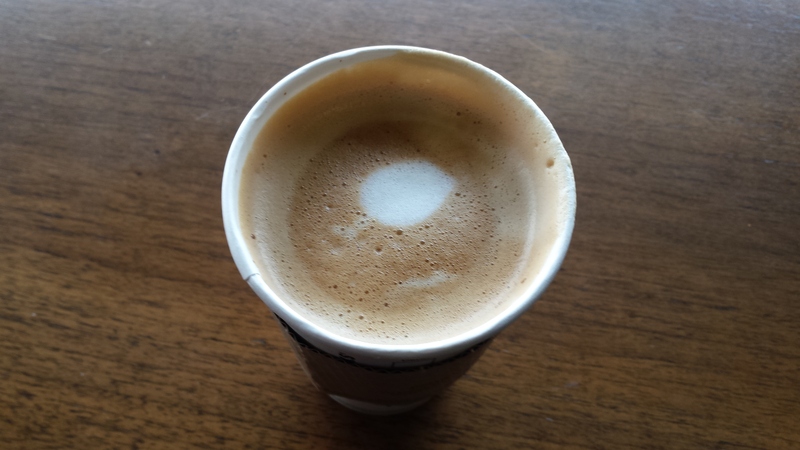 The first flat white I had last week had an amazingly thick, creamy texture as promised, which was the best part of the drink. But the taste? Ugh. The first note I detected was like sour milk–that is not the taste you want for your first sip! I realized the milk had not actually gone sour, but the coffee beans used to produce the drink possessed bitter notes that in effect made the milk seem sour. I wanted to give the flat white another chance, so I went to a different Starbucks today, hoping for a more impressive showing. Unfortunately, I think the barista botched it. There was no creamy texture whatsoever, and the flat white tasted incredibly watery. I wonder if the flat white is simply too complicated for rushed Starbucks baristas to craft properly as they jump and dive behind the counter to keep up with their massive influx of orders and cranky, caffeine deprived patrons. Sadly, I will not be giving the flat white a third chance. I think Starbucks was ambitious in trying to tackle an Australian staple, but ultimately the flat white will disappear, if you gauge society’s reception by the disappointed and lukewarm online reviews. 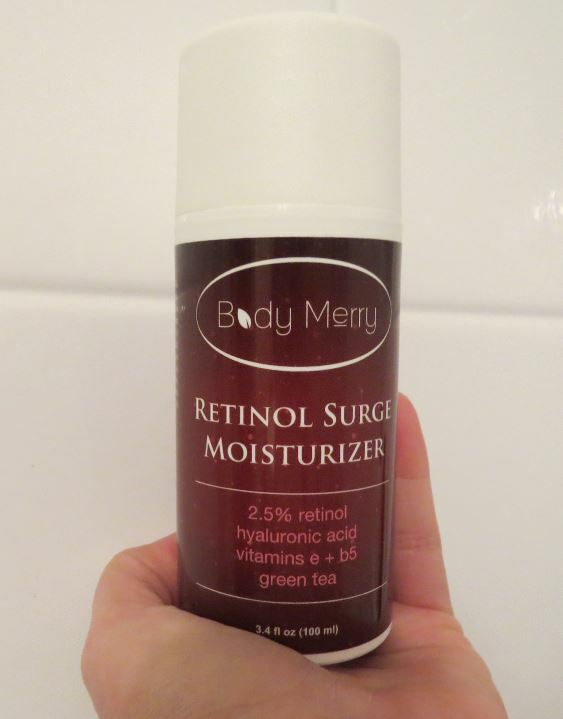 If you are seeking a multi-tasking moisturizer that is also all natural, organic, cruelty free and made in the USA, this Body Merry Retinol Surge Moisturizer is a great option for you. Packed with soothing ingredients like aloe and green tea, this gentle cream hydrates effectively, leaving skin feeling baby soft within mere seconds of application. In addition to being gentle and moisturizing, this product is non-irritating. Many creams infused with retinol cause immediate redness or stinging. In contrast, I did not experience any irritation, redness or discomfort with this moisturizer. The texture is what I would term a middle-weight cream. It is not a light gel; it is definitely thick and creamy. The moisturizer is not too thick, however, which is great for people like me who have oily facial skin and therefore want a product that absorbs into the skin nearly instantly. The product sinks in fast, so you can layer on your cosmetics or sunscreen within a few moments of application. This product is also unscented, which is wonderful for people with sensitive skin who tend to react badly to perfumes, or for guys who don’t want to smell floral or sugary. Although it is intended for use on the face, this moisturizer can be applied elsewhere, too. I happen to like it best on my hands. In theory, retinol helps reduce sun spots, discoloration and lines and wrinkles; I must admit I did not see such dramatic results in terms of reduction in discoloration when using this moisturizer. I should also note, however, that some of my sun damage is pretty bad, so an over the counter product might not be strong enough to combat my damage thoroughly. If you have only minor sun damage, this moisturizer will likely produce more visible results for you in terms of lightening up your spots or reversing out your fine lines and wrinkles. All in all, I enjoyed using this product and found it an effective hydrator that made my skin texture feel smooth and lovely. This alcohol free Natural Refresh Toner by Foxbrim is non-irritating and gentle, even though it contains the skin-tightening astringent witch hazel. Aloe is mixed into the formulation to provide soothing moisture and a green scent note. MSM (Methylsulfonylmethane), an anti-inflammatory, is also a key ingredient in this toner. Some people feel witch hazel is an anti-inflammatory also; for me, it tends to have cleansing and oil reduction properties, but it does not necessarily reduce my normal redness levels. The combination of witch hazel plus MSM in this toner might be extra effective for individuals with sensitive skin that is prone to ruddiness. As a toner, this product is light and watery, not oily. It does not sting. You can dispense the toner using the built-in pump-action spray nozzle, or you can spritz it onto cotton pads and then apply it that way. I prefer the cooling sensation of the spray. The one element that might bother you, especially if you prefer your products to be unscented, is the way this toner smells–sort of green, medicinal and herbal. You can definitely tell a number of plants with medicinal properties have been added to the product. I feel the aloe note was particularly strong, and this happens to be a scent I don’t like very much. But if you love the green, fresh smell of aloe, then this toner might smell extra good to you. In my case, I would have preferred a more floral or citrus scent. As some of you who have been following this blog know, I have been systematically working my way through some all-natural skincare lines to see how the different products and product textures work. 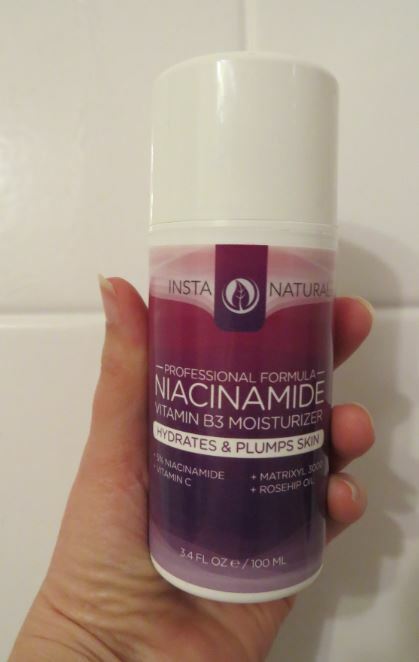 I spent the past few weeks trying out Niacinamide Vitamin B3 Moisturizer from InstaNatural. Although this product is marketed for the face, I found it to be a little too thick for me. My skin on my face is on the oily side, so I really cannot use thick creams like this one without breaking out. But if you have dry to normal skin, you can likely use this moisturizer liberally without any problems. It does have a light, perfumey scent, however; so if you prefer unscented lotions, you should skip this one. All things considered, this is a quality moisturizer that has a pleasant scent and a thick, emollient texture. Its other virtues include all natural ingredients like Vitamin C and rosehip oil, it is Made in the USA and there was no animal testing. The packaging includes a nozzle you can use to control how much product you pump out at one time, so you won’t have any big spills or mishaps. I will cut right to the chase for you: this Morea Hyaluronic Acid Age Delay Serum With Vitamin C + Green Tea erases age spots and sun spots. That is a pretty remarkable feat for a product that mainly contains natural and botanical ingredients! 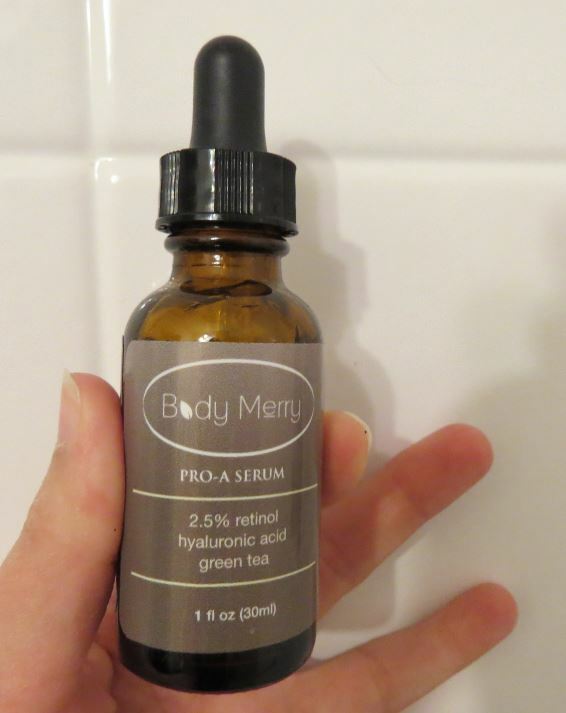 I applied this hyaluronic acid serum for about six weeks to a patch on my leg that had some bad sun damage and brown spots, figuring I would put the serum to the test against my worst tanning damage. At the end of my six-week trial, my spots had faded noticeably. I will continue to use the serum in the same location until the marks are eradicated. I am so happy with these results, because I hated those embarrassing spots so much. I compared Morea’s serum to another one issued by a different manufacturer. Sadly, the competitor’s offering did absolutely nothing for me–no changes to the slight hyperpigmentation along my hairline where I applied it. That serum contained only 2.5% hyaluronic acid. 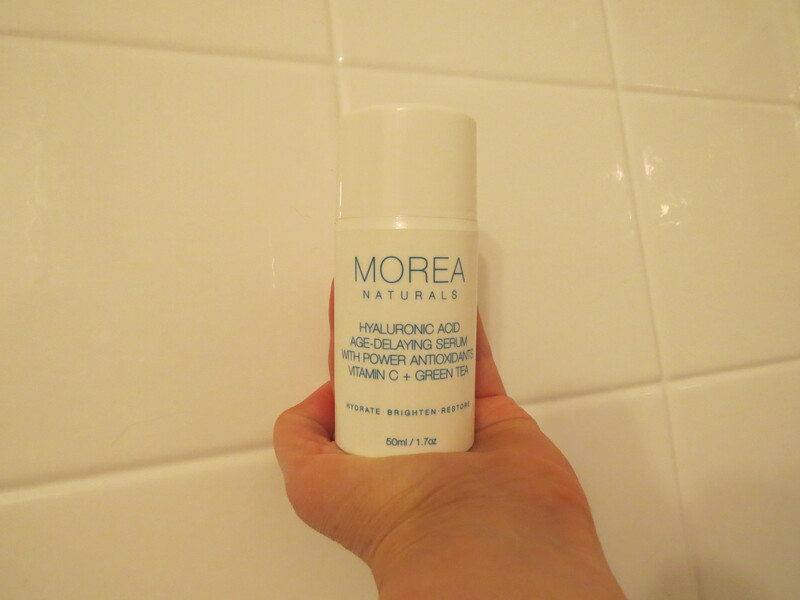 In contrast, this serum from Morea has double the amount–5% of 100% pure hyaluronic acid content. I think this is the key element that makes Morea’s serum so potent and effective. I am a convert and a believer. This is definitely a serum I will buy again. I should mention that the serum is odorless, absorbs mega-fast, and leaves skin feeling smooth and polished, all without irritation. I recommend this product wholeheartedly. 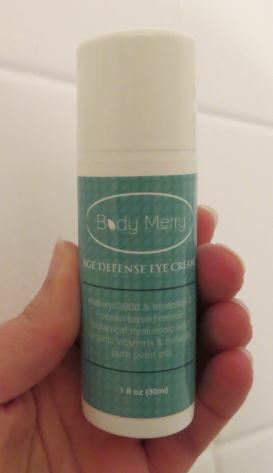 Body Merry, a skin care company that prioritizes the use of botanical and natural ingredients, has formulated a thick, emollient eye cream packed full of dozens of beneficial ingredients to both prevent and reverse damage caused by exposure to the sun and elements. Although I am not a huge fan of creams because of my oily skin, it is winter now and there is little to no moisture in the air, so this Body Merry Age Defense Eye Cream prevented the skin under my eyes from crinkling up as if I am 100 years old. Although I did not see the fine lines under my eyes change, I have only used the product for about 4 weeks, so in all likelihood another 4 weeks of use might be needed to see effects on the lines. What I did notice, however, is the darkness under my eyes seemed to dissipate so I looked more awake and well rested. Also, like I mentioned above, the hydration the cream provides is good for me right now due to how dry the winter air is here in Maryland. I don’t think I can use the cream in the summer, however, because of how oily my skin can be. If you have normal or dry skin, you can probably use this product year round without any trouble. Although Body Merry feels the cream is lightweight, it seemed thick and heavy to me, but I agree with Body Merry that it acts like a lightweight cream by absorbing quickly without leaving an oily texture behind–excellent. This eye cream is appropriate for anyone who prefers to use natural ingredients in the eye area (where the skin is extra thin) and wants to prevent or reverse the signs of aging, but it can be used by individuals of any age or gender to keep the undereye area looking bright. A Moisturizer that Combats Pimples and Blocks the Signs of Aging? Sign me up. In recent months I have had the pleasure of sampling various wholesome skincare products from InstaNatural, a company that prioritizes the use of plant-based and natural ingredients. 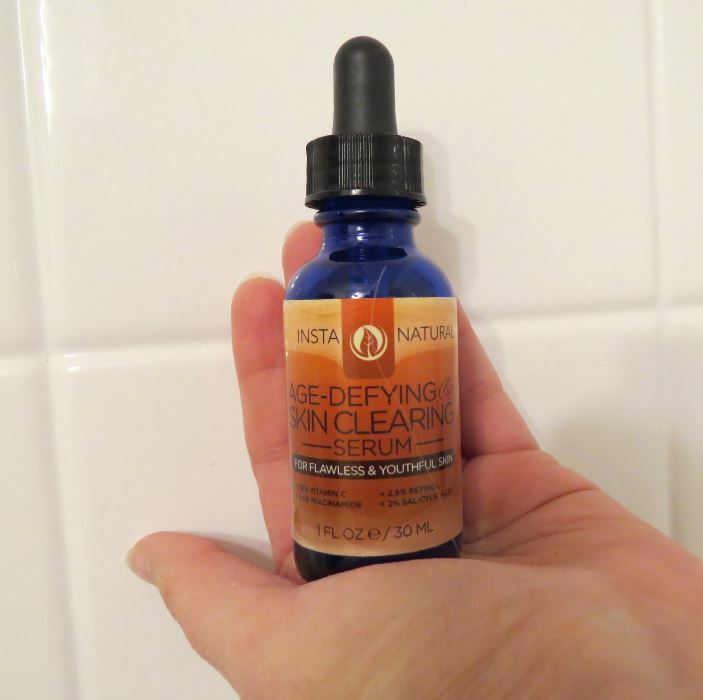 This month, I tried InstaNatural Age-Defying Skin Clearing Serum with great success. It’s like this skin treatment was custom created for me. I love gels and serums, which are known for sinking into the skin quickly; I just turned 40, so preventing the signs of aging is on my mind; and I still suffer from adult acne, so anything that prevents zits is golden. This product addresses all three criteria. I used the serum for several weeks and sure enough, my skin remained clear–no pimples or blemishes. The fine lines under my eyes were temporarily erased by the balm-like effects of the serum. They did not disappear completely, but I have only used the serum for a few brief weeks. With further use, the lines might show more improvement. Although the serum is not intended as a moisturizer per se, it definitely has a hydrating effect. It goes on like a lightweight liquid and is scented like citrus crossed with herbs. Vitamin C is a major ingredient, so the citrus scent makes sense. Vitamin C helps to slough off pore clogging dead skin cells and brighten skin tone. Retinol, which is known for reversing age spots and sun damage, is essentially a concentrated form of Vitamin A. This all natural Body Merry Retinol Serum combines Vitamin A with hyaluronic acid in a silky gel formulation that feels refreshing to apply. It is not in any way sticky and it absorbs quickly, making this gel suitable to apply underneath a moisturizer and/or foundation. Unfortunately, I did not see the spot lightening effects I had hoped for with this product. I have two areas of discoloration on my face; I applied the gel to both areas daily for four weeks. One patch of sun spots looked like *perhaps* there was some lightening of the marks, but not enough of a change for me to consider it significant. The other patch of sun spots did not change at all, and from what I have read online, my only option to fix it might be a laser treatment. My skin can be characterized as oily and average, meaning it is usually not sensitive. I was able to use this retinol serum daily without any redness or irritation, which is nice because some retinol infused products that use synthetic manmade chemical formulations are known to irritate and/or burn the skin, and this product only uses natural retinol. What this product *did* do for me successfully was hydrate without causing any acne or excessive oil production on my face. The spots where I applied the serum feel soft and healthy. I have decided to layer this product with Body Merry’s retinol cream to see if the two products in tandem will have an effect on my existing age spots. I hope to report back to you soon with positive results. In the mean time, I can recommend this product for individuals with light to moderate sun damage who want to use all natural ingredients only for their skin care routines and want some hydration. If you have heavier sun damage like me, you might not get dramatic results. But if your age spots and sun damage marks are not so severe, you might see better results than I did. Even though I did not get the specific results I expected from this product, I still enjoyed some of its positive effects, and I enjoyed its cool, refreshing, gel-based texture. I will continue to use this product as a moisturizer, even though it is not specifically designed for that purpose. My skin tends to be oily, so I was worried this cream might be too much for me and cause pimples. I used it daily in tandem with Adovia’s mild anti-acne sulfur soap, however, and that seemed to prevent any outbreaks. Although this cream did not eradicate my fine lines, it did produce a hydrating and plumping effect that hid them for multiple hours at a time, which was nice for when I wanted to look extra fresh, alert and at my best, like for going to a party. I can see how this cream prevents wrinkles from worsening by maintaining the skin’s moisture balance for hours on end. I have a feeling that my fine lines near my eyes might require laser treatment to get them to go away entirely; or, alternatively, perhaps if I keep using this Adovia cream for 6 or more months, I might see some greater reversal of the lines. Unfortunately, I could only test this product for one month. I am a great believer in Dead Sea salts and minerals, seaweed and similar oceanic ingredients for keeping skin hydrated, healthy and supple; Adovia’s Anti Wrinkle Facial Moisturizer is like a sumptuous skin care buffet of these ingredients. It’s a great hydrator, especially now as the cold and dry autumn weather descends upon us, requiring the application of stronger moisturizers. Rosehip seed oil is heralded as the solution for all manner of skin conditions, from eczema to acne to sun damage to stretch marks to wrinkles. Full of essential fatty acids, it’s supposed to be very nourishing to dry or dehydrated skin. The brand that landed in my hands—UNi 100% Pure Chilean Rosehip Seed Oil—is all natural and certified organic. A very promising package! 1. I applied it to my left arm and left leg each night for a week, and at the end of that time compared left side to right. I have dry skin along the backs of my arms (lucky me), and the arm treated with the oil did become a little smoother. Likewise my left leg looked better moisturized than my right. Not 100% improvement on both appendages, but maybe 50%. Perhaps with a longer timeframe I’d see better results. 2. I rubbed it into my cuticles, and generally all over my hands, each day for several days. Definitely resulted in lovely cuticles and frankly, nice-looking nails. So I saw a great result there. 3. In fortuitous timing for this product testing, I discovered a dry, scaly spot on my right forearm (about a half-inch in diameter). My skin does this occasionally, often in cold weather. I applied the rosehip seed oil daily to the spot for 4 days, and watched the dryness get worse. The skin turned red and flaky and the dry patch grew in size, perhaps indicating an allergic reaction. So I cut bait on product testing and treated with shea butter for a few days, which solved the problem. Total fail on the part of the rosehip seed oil in this particular case. 3. My husband swapped the rosehip oil into his skin care routine for a few days, applying post-shower instead of the coconut oil he typically uses. At first he was unimpressed, but then he made some usage adjustments and let me know what got results: using a full dropper of oil, rather than the 2-3 drops recommended, and slathering that generous amount onto his skin. He said that with the full dropper amount he finally felt like some moisturizing was happening, but found the quantity needed to feel a difference was too much for him and went back to his tried-and-true coconut oil. Details about the aesthetics: The oil absorbs into the skin fairly quickly and thoroughly, and leaves behind a light sheen that’s not objectionable. But although the label pronounces it “fragrance free,” I cannot agree. The scent is fairly mild, but it’s still there: a lingering earthy, almost burnt smell that I keep thinking smells like popcorn hulls (post popping). My husband couldn’t detect a fragrance, but I do have a Super Sniffer (like Gus on Psych), so it might be something only I can smell. I thought it was worth mentioning, however, for those users with scent sensitivity. My bottom line on this product is a mixed bag of results. If I gave the product more time, or maybe doubled the quantity I was applying, I might see more to cheer about in terms of skin hydration, but at least I ended up with improved cuticles.